This Evolution Traverse is many things. It is a huge alpine rock climb. It is geology, weather, logistics, campsites, cruxes, rappels, pitches and miles. It is history, intimidation, challenge and it was just a source of income to me. It has provided inspiration, camaraderie, disappointment and opportunity. I have wrapped myself up in this particular route, seeking further challenge, opportunity and adventure. What the Evolution Traverse represents to me is diverse and ever changing. What I wanted it to be and what I anticipated it being are also intriguing. My obsession with this particular route, heck, with climbing in general, is peculiar, right? Need we even ask the question of "why?". It is entirely possible that we can never know why we do things like alpine rock ridge traverses. It is also possible that we will never cease our search for an answer to that question. We can see the reasons and find objectives to fulfill them. Or we can find ourselves out "doing" and seek rationalization. Will we ever know the difference? Will we ever know the truth? Do we just "do" and then naturally and inquisitively seek answers to the question of "why?"? Or do we have deep desires, genuine and wholesome or otherwise, and throw ourselves at mountains in order to fulfill these desires? If the latter is true, that we have actual needs and desires that we can fulfill in the mountains, what are they? People want to do big things and be challenged. People want to make an impact and be recognized. Being the first to tackle something is a sure way to get recognized and is certain to increase the scale of that undertaking. Ian, last winter, showed me the opportunity for challenge and recognition in the Evolution Traverse. It had not been completed in winter. At the time, with a budding understanding of "firsts", all I saw was the opportunity for recognition. Don't get me wrong, I love being in the mountains, especially on an athletic route in difficult conditions and with a strong, entertaining and safe partner. But those experiences are a dime-a-dozen. A winter attempt at the Evolution Traverse would be all that and bring the recognition of doing something first. That was my rationale at the time. We didn't get the chance to earn the aspired-to recognition. We got out there and started out, but weather conspired to decrease our odds of success while increasing the likelihood and consequences of something bad happening. Bad combination, bail chosen. Not only did we bail on this big endeavor, but we got scooped from behind just days later. In a-more-than-amazing coincidence, the successful suitors left the trailhead the exact same day we did. Disappointment compounded disappointment. I got dark there for a bit. Why was disappointment so profound? I have come up short, experienced some significant failures, in the past couple years. A failed professional development course and a failed marriage are the most notable. I also nearly died in an avalanche in Alaska. Personal, I know. However, we cannot separate personal and professional and recreational lives. We are each complicated creatures. These failures are endeavors in which I have invested a great deal of energy and time. In some ways, each was out of my control. In other very real ways, I am ultimately responsible. In the throes of disappointment the distinction between what one is responsible for and what is out of one's control get muddied into a mess of self-flagellation. Failure in March with Ian on the Evolution traverse swirled around in a perfect storm of disappointment and recollections of recent short-comings. Failure breeds introspection and introspection breeds rationality. And rationality beats feelings of inadequacy. Moving past all that quickly left room for further reflection. What did we actually miss out on that week in March in the Evolution peaks? The lack of recognition could be easily dealt with. Who would continue to beat himself up for failing to earn accolades? That type of recognition is shallow at best. One could argue that seeking that type of recognition for it's own sake is bound to distract one from safe decision-making. However, we really did miss out on the scale of tackling something unknown. I wrote to a friend, a few days after hearing news of the successful send up there, "there's always value in tromping around in the mountains, right? Winter, summer, whatever. Being first has value also. Shallowly, there's the ego thing. But it also makes any endeavor that much bigger. The Evolution Traverse in winter is smaller now, psychologically. And I dig big things!" That got to the heart of it. I need not feel guilty for wanting something like the first winter ascent of the Evolution Traverse. Desiring recognition feels shallow and ego-driven. But seeking big challenge is a noble pursuit, in my book. And there will always be bigger things. That brings us to this summer. Not long after our winter attempt I booked a trip to guide the Evolution Traverse. Like the first winter ascent of a route, the first guided ascent can be seen as significant. It has all the aforementioned ingredients. It is an unknown. It is potentially something to be recognized for. It is a huge undertaking. As the dates for my trip to guide Jon around those peaks approached, I prepared well and rested my mind in the acknowledgement that my desire to complete this objective came from a pure place of embracing challenge. The opportunity to be recognized was still there, but I need not fret that I was some sort of ego-maniac driven by the need for approval. With my mind open to these more authentic motivations, I was left to relax and prepare well. Part of preparation was effective rest and distraction while in town. Work kept me active and acclimated. Town time, evenings "off" were free to take on carefree socialization. 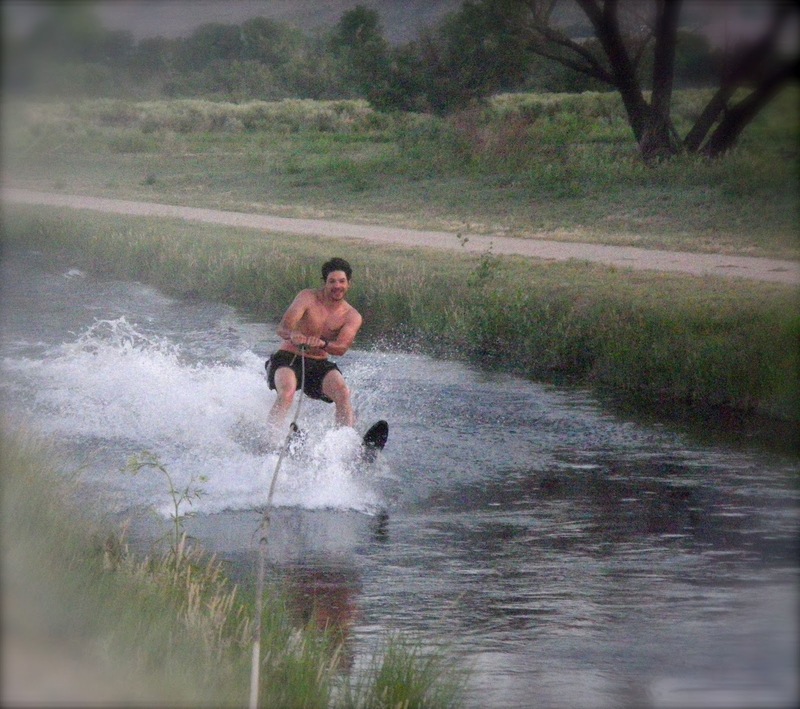 Evenings water skiing on Bishop's "wrong side of the tracks" canal were, honestly, the highlight of my early summer. This kind of thing, free of the possibility of recognition or big challenge or any other hidden agenda, brought the lesson's of my Evolution Traverse obsession full-circle. Not only is it fine to tackle big challenges, those big challenges are not the only thing that define a life. Life is also whimsy and friends and brainless sludgy debauchery on a sunset evening in the desert.